Recently an article appeared in the Jerusalem Post that detailed how the Bnei Brith’s Anti Defamation Commission had prepared a thorough report accusing two self proclaimed online news sources of being anti-Semitic in their representation of the Israeli-Palestinian conflict. While I do not necessarily dispute the conclusions of the ADC’s report, I have grave reservations about the ADC pursuing these accusations in a public way. While we are members of the Jewish community and have the right to act in our own perceived self-interest, we are also citizens of the broader Australian community. As such, our actions as an ethnic-religious minority will be perceived by the broader community within this context. In a liberal democracy people have the right to express views that we may find unpleasant or even unconscionable. Yet it is the right of the community to be able to both express and consume any opinions that they want, provided they do not cross clearly demarcated boundaries. 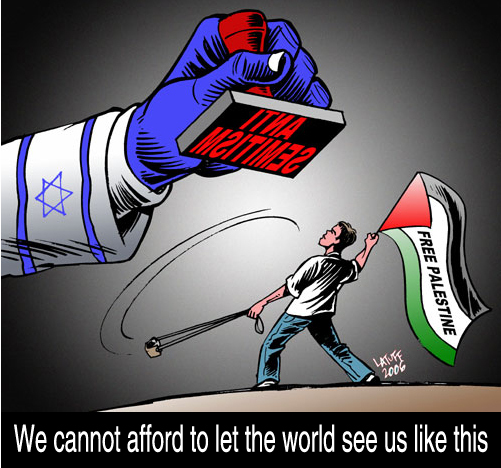 And while the boundary of anti-Semitism masquerading as anti-Zionism may be clearly demarcated within the Jewish consciousness, and arguably under the Racial Vilification laws it can be defined in a legal context as well, it has no such clear demarcation within the popular consciousness as do issues like arson or terrorism. No matter what we do, the population at large will never fully share our fear or disgust at negative representations of the Israel-Palestinian conflict. Attempts by Jewish organisations to silence voices they find unpleasant or unconscionable has two effects, both extremely negative for our community. It reinforces the notion that an entrenched Jewish establishment has a need to utilise legal mechanisms to silence voices that it disagrees with. It provides oxygen to the perpetrators. There are timely and newsworthy events that communal organisations should be at the forefront of combating. There is also valuable work that community organisations do in exposing not only the biases, but the ulterior motivations of certain high–profile figures. However, this does not mean that it is in our interest to go about creating news stories where none existed in the first place. The clearest case in point for this was the community’s handling of Antony Loewenstein. By reacting so vocally and so vociferously to his opinions and to his book, we aided and abetted the creation of a mountain from what could have remained a molehill. The community’s incessant demonisation of Loewenstein only served to give him even greater legitimacy in the eyes of his supporters, and the volume of our campaign against him brought many more into his camp. As a community we cannot afford to create another Loewenstein. The internet sites in question are not news services on the scale of a major publication like The Age or the Australian, rather they are niche services that cater to niche readerships, presumably with strong left-wing biases to begin with. Should the community actively pursue this issue and find it hurled into the public discourse, we run the risk of placing them front and centre of a media furore that will only serve to broaden their readership and begin to legitimise their platform in the eyes of many Australians for whom free speech is a fundamental value. Before we go about creating a new Loewenstein, we as a community need to seriously rethink our approach to dealing with anti-Semitic media, and to do it in a way that will not effect the creation of even larger enemies. i’ll get you my pretties, and your little dog too! We think this situation is complex. To what extent are these websites simply exercising their right to freedom of speech by invariably publishing content that is hostile to Israel, and allowing comments with highly anti-Semitic sentiments (including Holocaust denial) to remain unmoderated? By the same token, to what extent is the ADC simply exercising its own right to free speech by contacting the editors of these websites and sending them these reports? In this case, it is possible that the ADC has acted appropriately. They have voiced their opinion yet have not attempted to organise a boycott or any other such activity, which would have been counter-productive, bringing about familiar accusations that Jews are acting as the public censor. The jury will be out until we see whether or how this situation develops. There are some differences between this case and the Loewenstein case. A-Lo was such a hit with the anti-Semitic left because he just repeated what they were already saying, but did so as a Jew, thus providing them with cover from accusations of anti-Semitism. It’s no coincidence that a trashy undergraduate level publication like New Matilda has A-Lo (and his trusty sidekick, M-Bru) as the poster-children of their defence. The Loewenstein story has probably run its race so it’s not clear that the mainstream press will pick up this story simply based on the A-Lo brand. If this story does take off, as you seem to predict that it will, it would seem to demonstrate that there is a short-cut formula to publicity and prominence…and it doesn’t matter if you are the producer of (or actress in) a poorly written 8 minute play, a board of bourgeois Chardonnay-sipping socialists that gives away peace prizes, a web-based news aggregator, or just a complete moron who thinks he’s a Middle East expert but is not aware that the very feminine Tzippi Livni is a woman…. Bait the Jews, and bait them some more… and when they respond, in an often clumsy fashion, you get your publicity and your prominence. At any rate, your post will hopefully prompt any well-meaning Jewish parties to consider carefully the possible repercussions of tackling hostile voices in the media. Excellent post. You are spot on! I hope the ADC and others are reading this. Keeping in mind that it is part of the ADC’s mandate to monitor representations of Jews in the media, and their findings (whether one agrees with them or not) are rooted in genuine concern, do you have any suggestions for how Jewish community organisations (such as the ADC, or possibly some other body) could approach ‘third tier’ media outlets such as New Matilda without creating a drek-storm in a tea cup? Is it better to simply ‘let alone’? Or is there a way we could reach some sort of detente without writing reports and letters? This is going to turn into a very hot discussion on this site, but I hope that our ‘friends on the right’ can restrain themselves and rather than acting vindictively, offer some real argument. I’ve written about this issue elsewhere, but I wish to remain anonymous, so I only want to raise some key points. I haven’t been able to find the ADC report on its website. If someone can point to this report, it might enable more considered opinions. But I’d like to throw in a few points into the discussion. Based on past history, I suspect it is a highly subjective report (reflecting the collapse of anti-Zionism–critique of Israel–anti-Semitism into one category ‘antisemitism’. Such reports also fail to distinguish between the words as published and the actual intelligence of the reader in assessing the worth or otherwise of such writings. Of course, the problem, as is endlessly debated, without resolution is that the problem is much more complex. We see the same position being put about conspiracies in higher education, other media etc. It seems to be an ideological script coming out of somewhere, to run a particular ‘hasbarah’ line, rather dealing with the crisis of Israel as a democracy in the 21st century. * there are genuine, intellectually honest critics of Zionism and Israel [some people can’t bear to hear this, but I think it is a reasonable statement, painful as it is]. Sometimes the argument rubs raw because it is too close to the bone, or the discourse seems to not take account enough of ‘Jewish’ concerns. I find it painful at times and misinformed, but not intentionally anti-Semitic or vindictive. It also reflects the low quality of scholarship about Jewish, and for that matter, Palestinian history in this country. To conflate all these into a ‘antisemitism’ as a defense mechanism against critique (including the nutters who add comments to websites) is sloppy and ingenuous. Having published an article on one site, I am aware how many crazies and nutters there are, and on both the left and right feed off each other and thrive on such websites. However, to take anti-Israel commentary at face value ignores why such criticisms are being offered (e.g. the occupation for starters is one essential reason). Strong critiques are offered because there seems to be no other way to explain the current ideology and practice of oppression of the Israel government [and yes, there is hypocrisy over other regimes, but the point is, if Israel claims it is a democracy, then like the US during the Vietman War, its oppressive behaviour betrays the principles of that democracy. Consequently, Israel is judged as any other country that subscribes to Western values, and as long as ‘official Jews’ are tied into a ‘defensive offensive’ of the indefensible for Israel, there are going to be problems. And of course, there is a lot of criticism of other western countries to be had. Thus to use the label of ‘antisemite’ as a means of clubbing the left only pisses off people and makes them more vociferous and even less understanding or tolerant of the Jewish experience and likely to think of conspiracy theories. There is probably real resentment at such statements by the ADC and the power of such a label being used against the free press, and by association, with progressive politics in general. In a networked world, people know how various right-ring Jewish lobby groups have acted as thought police in the US, and they don’t want that situation here. The ADC could be shooting itself in the foot. The chief complaints are that it gives Lowenstein and Michael Brull an opportunity to vent their spleen. Second, the comments that are appended to their articles are sometimes nasty and antisemitic and not removed. However, anyone can contribute to New Matilda, and the ADC does not appear to have made an attempt to publish an alternative viewpoint (why not?). ADC also makes the point, that Israel is criticised when other regimes or crises (eg Darfur) are not. But the point as I made above, is that Israel claims to be in a similar league to us, not a tin-pot dictatorship. With respect to the offensive comments on the website, as someone noted in the Jpost comments, the comments are a mirror image of the racist garbage level by rightwingers on Haaretz or Jpost. I suspect people who read these sorts of pages can readily identify the nutters. If New Matilda is at fault it’s the editors of not being able to source more respectible, but critical material (e.g. Bernard Avishai), but they would STILL be accused on the basis of that, of not being ‘explaining’ enough of Israel’s situation. So yes, New Matilda runs some frothing at the mouth, immature stuff, but no, it’s not engaged in vilification or outright racism. The ADC should be more careful. We have a problem Houston – do we always seek to over-analyse and over-compensate for being an ethno-religious minority in a secular Western liberal democracy or do we remain vigilent about behaviour, political activity, propaganda or grey area crimes that strike at the heart of the stability, safety or security of the community. Five arguments against the current robust reactions: it provokes a sense of unjustified martyrdom for those guilty of antisemite actions; it provokes suspicion by some that the community is thin-skinned; it equates minor action with major threats; it contradicts the liberal traditions in favour of free speech and dialogue so well supported by Jewish Australians since first settlement; and it risks escalation of the war of words into other actions. Five arguments in favour of the ADC approach: moral/legal/racial wrongs should not be discounted due to the insignificance of the perpetrators; if the community is not prepared to speak up why expect the others (the 99%) to be actively responsive to antisemite acts; there is no “acceptable” tolerance level for racism, homophobia or religious intolerance so therefore no reason to let some acts go under the wire; with freedoms come responsibility and social community standards of behaviour; words incite more than acts, they empower hate and misguided frames of reference that allow crimes to the thought before they are attempted. On balance, I am prepared to always be the small c conservative and say robust/active is better than relative/reticent. In recent weeks, the debate has raged between traditional, print-based journalists, and new media reporters on websites like TMZ, as to just what constitutes journalism. People like Hartigan would sooner see news online crash and burn, rather than admit to the insufficiency of traditional media to combat online’s immediacy and mobility. But he does have a point in one particular point – Who is a journalist these days? Can you compare the skill, talent and knowledge of a print-trained journalist Vs. a blogger? Do we even need a journalism degree, or is a cadet-ship sufficient to ensure practical, professional and ethical standards for those who write in for our nation’s fourth estate? No where is this more apparent than in the independent media sources we find online these days. Web-based, opinion heavy news sources that attempt to provide an ‘alternative’ viewpoint, for the discerning news consumer. However, this ‘alternative’ position, though generally purporting to maintain balance and professional ethics in this new format, also provides something that print media has not. Now, this is no letter-to-the-editor. This is purely and simply, a chance for the readers to vent their spleen at the content on the website. Sometimes insipid, sometimes controversial, sometimes blindingly ignorant – these comments are what makes new media work. Doing away with the censorship and filtering of the editorial department of the newspapers, new media gives the ordinary layperson, the chance to air their misspelt, grammatically incorrect diatribe – even if it completely off topic. POWER TO THE PEOPLE. Of course, when the people are racist, prejudiced, hate-mongering or inciteful, the comments are disallowed. The comments aren’t actually posted are they? There IS someone monitoring the comments, isn’t there? It’s not just a free-for-all, is it? And if some should fall through the cracks, They ARE deleted … Right? newmatildais a self-described news, analysis and satire media outlet, with a strong independent, left-leaning, “fighting-for-the-underdog” slant to their articles – be they soft/hard news or comment pieces/analysis. So straight off the bat, while promoting themselves as non-partisan (with “no association with any political party or media organisation”) they are subcribing to a small ‘l’ liberal outlook, with a penchant for misleading their readers with undefined analysis-as-news. Someone should get these kids a dictionary*. Those people who follow newmatilda for a laugh, a head scratch or simply to get themselves fired up before hitting the gym would be well aware of their track record on Middle East reporting. If not, let me fill you in with this, and this, and this, and oh, this. And that’s not even getting into their recent coverage of the recent war between Hamas and Israel in Gaza. Point is, they are known for their pro-Palestinian coverage, for their categorization of Israeli sources or sympathisers as ‘propaganda’, and their refusal to balance the Loewnstein/Brull double acts with another perspective. But the Anti Defamation League took issue with their refusal to address issues of bias, and they came up with this report, as covered by Israeli English language daily The Jerusalem Post. newmatildacontributers Anthony Loewenstein hit back the same day with ‘If You Don’t Agree With Us You’re Antisemitic’, underneath which the comment section was thankfully disabled. Such a ‘headline’ would have sent the comments into an MJ-is-dead-on-Twitter meltdown. Finally, the editors of newmatilda decided to act, as mentioned by shutting down the comments capabilities on any/all Israel/Palestine articles, and issuing this unapologetic editorial. So here we stand. A source that refuses to stop fuelling the fires of racial villification, hate-speech and Holocaust Denial by addressing the bias within its editorial department, but insists on “reluctantly” removing the ability of readers to show their distaste? No need to thank me for the free plug. Of course, it does seem problematic that currently 100% of the posts on your blog are essentially in favour of boycotting Jews, yet you unfortunately refuse to boycott this Jewish website. Unless you are writing posts on your blog in favour of boycotting China, and almost every other state that is not perfect, including Australia (how on earth will you manage that one? *), you might want consider the possibility that your support of a boycott against Israel is anti-Semitic. *Time to move to Micronesia? Many more such comments are still on the Telegraph’s website. However, the ADC has not raised a peep of concern about such racist vitriol, preferring to focus on the New Matilda, which looks like a model of civilised discourse by comparison. Firstly, I think everyone would agree that anti-semitism is a grave charge. What interests me is the relative disregard of this charge on the part of the people being accused of it. Instead of actually perhaps standing back and examining the issue – i.e. why are people regarding this as anti-semitic?, instead we see a dismissal of it as a smear or tactic to stifle their views. There doesn’t seem to be any serious introspection on the part of the accused. This leads one to consider is it worth actually engaging these people directly? Let’s be real – if they cannot see the seriousness of being accused of bigotry/racism etc how ever are they going to see any validity in an opposing narrative/view/argument? Are they so emotionally invested in their position as to have lost any critical/objective ability? And if so, can you engage them with any hope of honest discourse? Secondly, noting the gravity of the charge – are Jewish organisations actually using this in a cynical way to stifle debate? Can examples be pointed out which clearly demonstrate this? Is this a tactic? If it is, how should we address it? Thirdly, we see another poster bring up the issue of comparing to other western/democratic examples making it difficult to defend. Fair enough – however, why aren’t the critics also talking about BDS against the US for its crimes, or even Australia for its crimes for example? Why the exclusive focus on the I/P conflict? Is this the most important human rights issue in the world today and who made it so? Similarly, if the critics pretend to have concerns for the oppressed then who cares if the regimes are dictatorships etc? their people still deserve solidarity and we in the liberal west are in the position they are not in to assist them. To argue that they are dictatorships and that criticism wont matter is to callously disregard the oppressed as a lost cause and undermines one’s own moral credibility. Call for BDS against China – they are heavily invested in trade etc and will be affected by it. Call for BDS against Israel too, but while your at it, apply it to Hamas as well for its atrocious political and social positions – positions which were given political recognition through a democratic process on the part of the Palestinian people and are the antithesis of left-wing values. I’m the editor of newmatilda.com. I just wanted to put on record that the ADC never sent me a copy of their report and i was never given the opportunity to respond to its contents before they were widely publicised. Putting aside the legal concerns this raises, i also think it is just a little bit hypocritical given the ADC’s charges of unprofessional conduct on my part. I would also like to bring to the attention of fellow readers Michael Brull’s seeming double standard on hurling accusations around to those who disagree with him – note that he has referred to me publicly on the IAJV site as exhibiting extreme “anti-Palestinian racism” for being one of the very few people to actually comment on his postings and despite no evidence to support that conclusion nor knowing me personally. *I bring this up as Brull wrote about the SJ site regarding not responding adequately to the accusations made against him personally. TheSadducee says: “Firstly, I think everyone would agree that anti-semitism is a grave charge. 1. Yes you are right, it is a very serious charge. Extremely serious. 2. This extremely serious charge is wantonly thrown around at anybody who finds themselves unable to agree with everything Israel does. 3. Consequently, most people accused in this way *already* know they are not guilty of it. So they don’t *need* to give any consideration to it. Furthermore they have already seen countless examples of good, honest, thoughtful people being smeared with this very same accusation. Consider what it is like to be accused of hatred that you do not have. Hate is a strong emotion. You know if you hate something. So if someone accuses you of possessing a strong emotion that you do not possess, it doesn’t take much reflection to determine that they are in error. It seems to me that you have lost sight of what anti-semitism really means, but you are hardly alone in this. What are you going to say when you see a real anti-semite? You’ll have nothing to say because you’ve already devalued the expression trying to win arguments using a dishonest smear. I do not agree with everything Israel does, and yet to the best of my knowledge, no one has ever called me an anti-Semite. if you disagree with an Israeli action, have you ever stated that? Have you ever publicly criticized Israel? Please provide some links. If you do so in a way that is actually noticeable, then you will attract accusations of antisemitism and self-hatred. Simple as that. Don’t believe me? Why not try it sometime? How about you write an article in The Age, detailing your favourite (but until now secret?) critique of Israel? I look forward to witnessing your act of courage, but I’m not holding my breath or anything. I completely agree that anti-semitism is a grave matter and charge to make. I can also agree with you that accusations of anti-semitism are thrown around in a casual manner which is not befitting those making the charge and/or is appropriate to the situation. However this fact alone does not necessarily mean that an informed and principled individual should disregard the accusation – precisely because it is so serious it deserves especial attention. What happens if the accusation comes from an informed/intelligent contributer to the discussion? Are you suggesting that it should be disregarded because it has been misused in other circumstances? The problem arises when people “think”, or better yet, “know”, they are not anti-semitic and yet indulge in anti-semitic arguments, tropes, associate with anti-semites, etc all in the name of solidarity with the oppressed Palestinians or Lebanese etc. Their committment to social justice etc blinds them to the fact that they are involved in this sort of prejudice and/or excuses it in their mind – they become incapable of introspection and this is extremely tragic. Those who presume to be of the left shouldn’t compromise their core values in any circumstance, especially to associate with elements (eg. Hezbollah, Hamas, Muslim Brotherhood) that if were in their own societies they would justifiably find repugnant. I’m not saying that critics of Israel should be silenced. I’m calling for some intellectual honesty from them – criticise all human rights abusers and regimes and apply their standards equally. Otherwise be prepared to explain why you focus on Israel and Jews disproportianately. As to my own views on anti-semitism – I’m a known Jew in my workplace and life. I take the charge seriously and don’t use it casually. I certainly don’t challenge complete strangers to publish material just to confirm my own views about whether they’ll be accused of anti-semitism which strikes me as devaluing the matter if anyone is. Which category would you place yourself in? I find it hard to believe that you are simply a disinterested observer, given how frequently and passionately you comment on here.